I think they are really clever, look bright and inviting and I hope they will encourage visitors and newcomers to record their visit so we can keep in touch. But they will be useless unless we have visitors and newcomers. We have been blessed by a regular trickle of people who have come to our church to try us out: some of whom who have found a new spiritual home with us. We have been thrilled by those who have come to faith in Jesus at our church and have become a part of our fellowship. It was a joy last week to meet a lady who had come because she had found us through our website, and another man who had come because he had walked past the premises during the week. But we also have a responsibility to our friends, colleagues and families to invite them too. If what we have experienced of Jesus is good news for us it is surely good news for them as well. If we don’t invite people we can’t be surprised when they don’t come! I do not believe that having more people in church services is the purpose of church. Our purpose is to be followers of Jesus and to make him known to others. Making him known doesn’t have to be on Sundays (and in fact is most effective as we are free samples of Jesus wherever he places us in the rest of the week). But one of the ways in which we are fed and equipped to do that is through worship services so it is good for us to gather together. I also do not believe that a church should grow at the expense of other churches. I would hate to think that we were growing in attendance because people were leaving other churches to come to us. Of course it is right that God moves people to attend other churches from time to time – that’s natural and healthy as we grow in our relationship with Jesus. But that’s not what I am talking about. 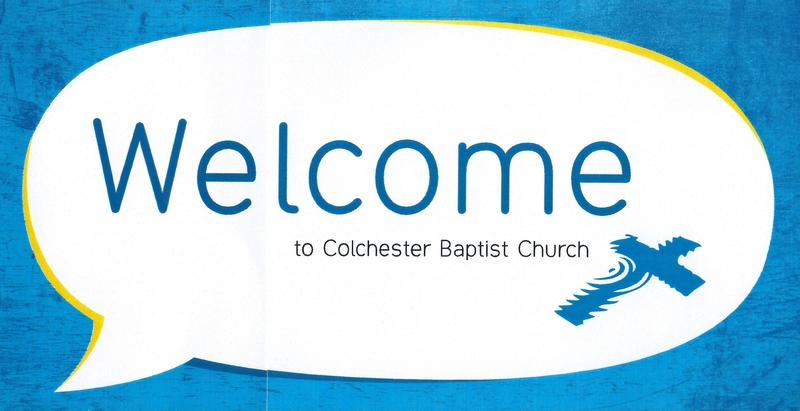 I am against the approach that I have seen elsewhere (not in Colchester) where Christians are actively encouraging people to leave their own church to attend their church. Last Sunday evening we had a wonderful service where people from our church shared about their favourite song or hymn – why it was important to them – and then we sang those hymns ‘Songs of Praise’ style. It was wonderful not only because of the singing but because of the honesty and depth with which people spoke of their faith. That’s attractive. When people can see that Jesus makes a positive difference in people’s lives they will want to come and find out for themselves. I really hope we run out of these cards soon – not because people take them away because they are so attractive – but because they will have been used for their purpose and that may be a sign that we are being decent (if not good) free samples of Jesus as individual Christians and as a church. They are great, are they copyright? Thanks Nick. Please give the Essex Magical society greetings from the North Western Society of Magicians, Blessings.